With our exceptional exterior renovations, the exterior of your Mooresville, NC home can be as inviting as the interior. Exterior Renovations in Mooresville & Lake Norman – With Chad Goodin Signature Homes, your home can be the envy of the neighborhood. We specialize in all styles and sizes of luxury and custom homes to give your home a unique and stunning feel. With our exceptional exterior renovations, the exterior of your home can be as inviting as the interior. Welcome guests, family, and friends with exterior lighting, new paint and siding, or updated walkways. Whatever you have in mind, we can make it a reality. Exterior renovations can turn a home into a spectacular one. A fresh coat of paint can do wonders, and there are many other tiny details that can bring new life to a home. If you have an older home or are considering selling, exterior renovations can be especially important in raising the value of your home and drawing attention for potential buyers. Even the simplest of exterior renovations can significantly change the atmosphere of your home. At Chad Goodin Signature Homes, we work hard to see that every dream you have becomes a reality. We have over 30 years of experience in land and structural development. 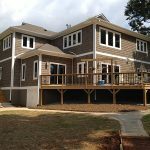 Our superior workmanship allows us to stand out from competitors, and our excellent reputation in the Mooresville, NC area is a testament to our continued commitment to meeting the needs and desires of our clients. We can give you a list of suggestions or work with your current ideas to design a home that better meets your expectations. If you have exterior renovations in mind or if your home is in need of something more, contact us today. At Chad Goodin Signature Homes, we proudly perform exterior renovations in Mooresville, Cornelius, Davidson, Huntersville and the surrounding Lake Norman area of North Carolina.